Periodontal disease is the term given to the final stage of severe gum disease, and can be extremely dangerous to your overall oral hygiene. Periodontal disease is caused by a bacteria infection deep into the jaw and bone line, destroying tissue and weakening bone. Periodontal disease is not curable, however, it can be treated to soothe its symptoms through regular visits to your dentist and improved hygiene. 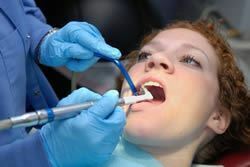 If periodontal disease is left untreated, the bacteria underneath the gum line will eat away at the anchor holding your teeth in place, loosening them and – in the worst case scenario – causing them to fall out. If you believe you exhibit symptoms of periodontal disease, or wish to find out more, please call us on (03)97020234. Our knowledgeable staff are more than happy to consult with you on the dangers of this disease, and suggest any preventative treatments or whether further examination is required.